When we go around the world, it is like taking the world in our arms; we can cradle it a little bit. On March 21, 1999, a bright silver balloon came down from the sky and landed on a desolate desert in Mauritania. The landing was an occasion for celebration: it was the third attempt of Bertrand Piccard, a psychiatrist from Lausanne, Switzerland, and Brian Jones, a British hot air balloon instructor, to circumnavigate the globe, and this attempt had been successful! Since 1993, balloon teams had made 23 attempts to circumnavigate the globe. 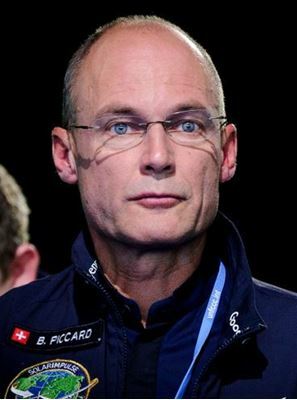 Piccard himself had launched two of the failed journeys. Due to a remarkable concordance of skill and luck, and perhaps also due to the absence of bad luck, the 24th attempt proved successful. 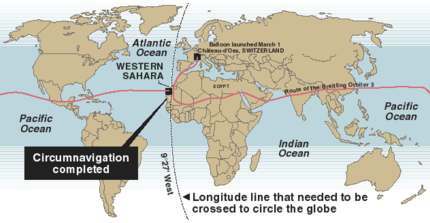 Piccard and Jones began in Chateau d'Oex, Switzerland on March 1 and crossed over Mauritania (see map below) early in the course, placing their circumnavigation mark at 9 degrees, 27 minutes west. This became their finish line. (The zero degree longitude line passes through England, France, Spain, Algeria, etc.) The two flew over Northern Africa, Asia, Mexico and the Caribbean before returning to their point of departure. Finally, the ground team reported to Piccard and Jones that they had crossed the finish line, and the pilots began their descent. Reports about the landing were mixed. Observers thought that the landing was nearly perfect, although Jones said that the pilots had to put holes in the gondola in order to make the balloon stop. Bertrand Piccard seems to have been born to lead such a record-breaking journey. His father, grandfather and great uncle were scientific inventors and explorers, and have a collective entry in Compton's Encyclopedia under the heading, "The Piccard Family." Bertrand's grandfather, Auguste Piccard, invented the pressurized crew gondola, a device enabling balloons to fly as high as 50,000 feet. Auguste's twin brother, Jean-Félix, was a chemical engineer who conducted stratospheric explorations in balloons for cosmic-ray research. Auguste's son (and Bertrand's father), Jacques Piccard, worked for NASA and also invented the Bathyscaphe, a submersible vessel which allowed Piccard and U.S. Navy Lieutenant Donald Walsh to explore the 36,198-foot depth of the Mariana Trench, the deepest part of any ocean on earth. Growing up in such a family, it is no wonder that Bertrand Piccard would become an aviation enthusiast early in his life. Very early on he admired those who, in his words, "showed how interesting life could be if you explored the world." Ironically, the heroes he named--astronauts James Lovell, Bill Anders, Scott Carpenter, John Glenn and Wally Schirra--all made their mark exploring beyond the world. While still in college, Piccard hang-glided and flew light aircraft, behaving as if he were meant for the sky. "It would have been stupid to come just to glorify ourselves or our team about having achieved this flight. What we wanted to do was pay back a little bit of the luck we had to succeed and to be useful to the people that we flew over. ... because our around-the-world flight gives us a lot of [exposure], a lot of interviews, a lot of lectures... And it gives [us] the possibility to talk about ... all the suffering there is on this planet. [This suffering] is not something that is so far away from us." In September, 1999, the successful balloonists created the Winds of Hope Foundation to combat forgotten or neglected causes of suffering throughout the world, especially those affecting children. Their work spreads hope around the world. The Circumnavigators Club - Brings together those men and women who have circumnavigated the globe, and encourages global fellowship and understanding. 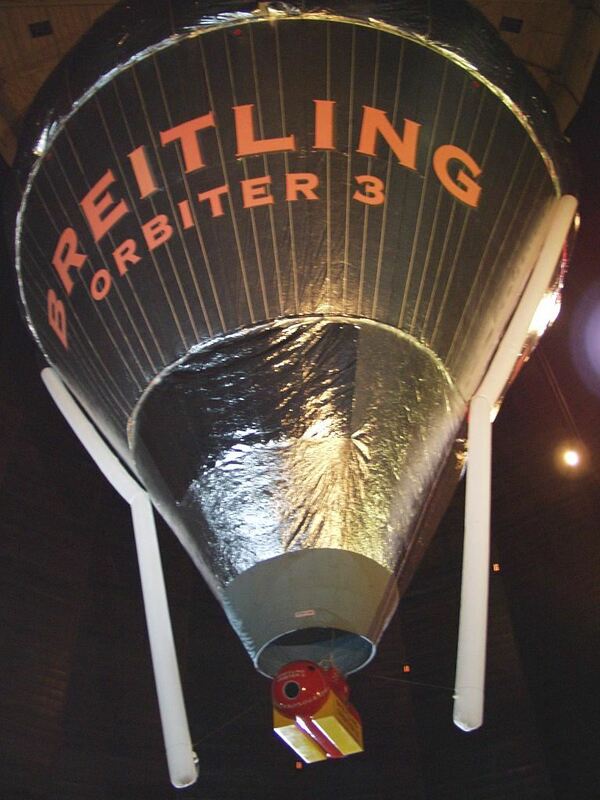 The Smithsonian Institution's National Air and Space Museum - This museum now holds the Breitling Orbiter 3. - Are you interested in hot air ballooning? This magazine is dedicated to the sport. John Glenn - is one of Bertrand Piccard's early heroes. Read the book Around the World in 20 Days by Piccard and Jones. Most heroes are inspired by others. They often find the courage they need to achieve their goals by realizing the faith that others have placed in them. One wonderful example of the positive power of belief is explained by Piccard in the book. Before the flight, at the Jules Verne Restaurant in the Eiffel Tower in Paris, the Great Grandson of Jules Verne, Jean-Jules presented Piccard and Jones with a special leather bound book by Guy de Maupassant called, Une Vie . The book had belonged to Jules Verne and became a talisman (good luck charm) for the balloonists. When Jean-Jules presented the gift to Piccard he stated that he believed that this team embodied the true love of adventure that characterized his great grandfather. Piccard was profoundly touched by this honor. "It (the gift of the book) came at a moment when I was racked by doubts...about the flight, about the wisdom of the whole enterprise.... When I opened my heart to the founder of the Jules Verne Adventure Association asking whether he thought that I was right to risk so much - my family, my job, my nice life - he gave me a robust answer. 'It's not a question of whether or not you have the right to fly,' he said. 'You have a duty. Mankind needs people to do things like this. People are going to dream with you. The fact that we are giving you this unique book shows how much we trust you.' I found his words very moving and returned to Switzerland with my energy restored, suddenly seeing everything clearly. In other words, that book was one of the crucial factors that got Orbitor 3 into the air and me out of an ocean of doubt in which I was drowning." _____________________________________ Matthew Rassette from Midland, Michigan wrote this review of Around the World in 20 Days for AMAZON.com. 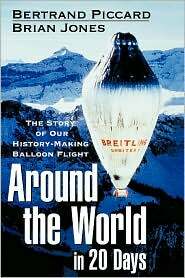 "I'm writing this review having only read the first 112 pages of this fantastic real-life, just-yesterday-adventure (I kinda know how it ends...), but the good feelings that I get from hearing the first hand account of Bertrand and Brian's epic balloon flight has sent me out finding copies to give to friends for the Holidays. Their down to earth (no pun intended) narrative, while maintaining a soaring spirit of adventure reminds me of stories from favorite teachers and mentors from my past. Open this book while in your favorite chair before a warm fire, and soon you'll feel as if they are sitting across from you, telling the story themselves."